Poland's heavily wooded landscape made game & fruits of the forest a staple for special celebrations. 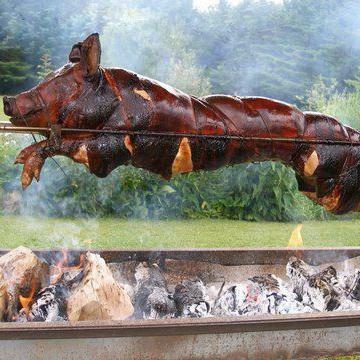 Enjoy succulently 'roasted boar' (it's actually fresh, Rhode Island farm-raised delicious suckling pig, professionally roasted on site at the polo grounds for your dining pleasure) with beloved Polish favorite sides & dessert, following USA vs. Poland. Farm-fresh meats and locally sourced produce expertly prepared for the teams after a hard-fought match. Tickets* $28 per person, quantity limited, by advanced reservation until sold out. Cash bar. Catered fieldside. Polo match tickets sold separately. *Must present ticket at the buffet; Tickets are for individual dinner portions per person. This is NOT an unlimited buffet. Besides being a fabulously Polish name, Poland's legendary Bialowieza Forest, is Europe's only remaining primeval woodland, covering some 500 square miles in eastern Poland and Belarus and home to bison, elk, deer and wild boar among other game roaming the famed lowland forest hunting grounds today.